Health & BeautyOlimp Gold Krill - 30 kaps. Olimp Gold Krill is a dietary supplement containing high quality oil from Antarctic Krill Euphausia superba, coming from the cleanest waters of the Earth. Conditioner in the form of convenient capsules Olympus Gold Krill is a product rich in essential fatty acids omega-3 phospholipids and astaxanthin - the components to support the proper functioning of the heart and circulatory system. Omega-3 krill oil present in the prevailing anywhere combination with phospholipids which enhance their bioavailability in the body. In addition, preparation is produced in an innovative technology - Flow Caps ™ Liquid Technology - guaranteeing up to rapid absorption in the body, freshness and lack of odor characteristic of krill oil. 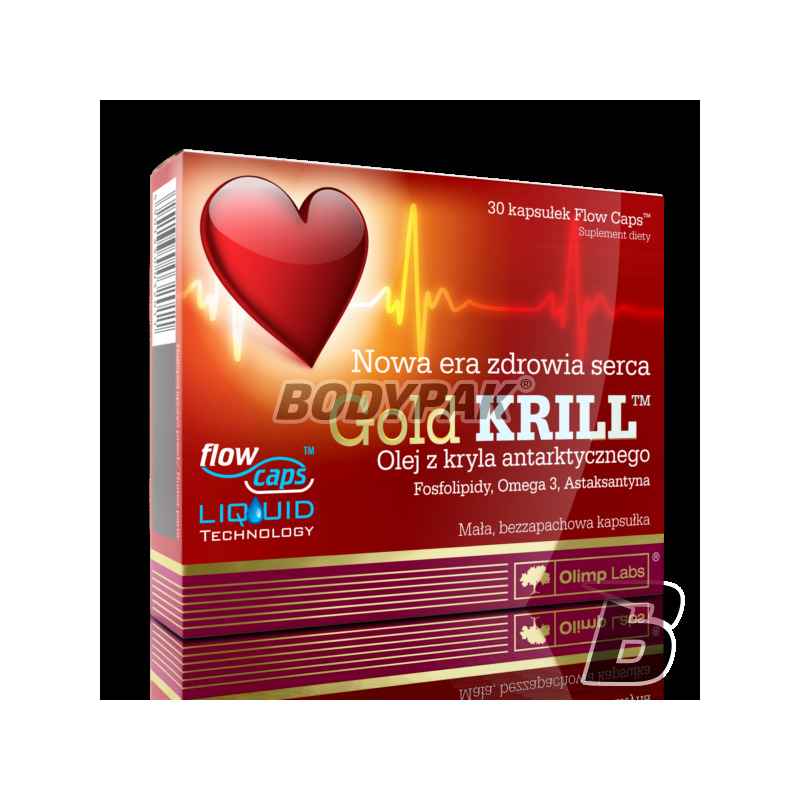 Krill oil contained in the nutrient Olympus Gold Krill is a true innovation in recent years in the area of ​​the heart. The discovery of the unusual properties was the result of hard work by a team of scientists from different fields of science and medicine. Numerous scientific studies confirm that it shows a strong and comprehensive action to support the work of the heart and circulatory system. It provides components that help in the formation of normal HDL cholesterol and LDL cholesterol, triglycerides, have a positive effect on blood clotting and blood pressure and neutralize free radicals, so that affect the smooth functioning of the heart and circulatory system for many years. To ensure the maximum protection of the cardiovascular system Olimp Gold Krill combines three innovative substances. - Omega-3 in the phospholipid form connections: The vast majority of supplements on the market contain omega-3 in the form of triglycerides or etyloestrów, manufactured from fish oils. Gold Krill is a completely different quality. Omega-3 fatty acids contained in krill oil are present in the form of phospholipid connections. What is the difference? With fosfolipidowemu carrier, definitely increases absorption and utilization of omega-3 in the body. - Phospholipids: Phospholipids are essential structural components of every living cell. Includes, as part of cell membranes by participating in the transport of substances into and out of the cell. Consequently, they play an extremely important role in the functioning of the heart, blood vessels, nervous system. They are involved in the control of cardiac function and in the regulation of lipid metabolism. - Astaxanthin: Krill oil is a source of astaxanthin - one of the strongest known antioxidants. It removes free radicals, which are the cause of many negative processes in the body. Free radicals oxidize, among others, bad cholesterol, which can then contribute to increasing the risk of atherosclerosis and coronary heart disease. Miałam niekorzystne badania krwi ale po miesiącu suplementacji tym produktem wszystko wróciło do normy! An excellent preparation based on the highest quality turmeric powdered root. Each serving is an incredibly rich source of natural active substances that have a positive effect on the work of the nervous system (including the brain) and the immune system! Each serving has a slow release! Put on the highest quality!